Bayou Macon is a bayou in Arkansas and Louisiana, United States. 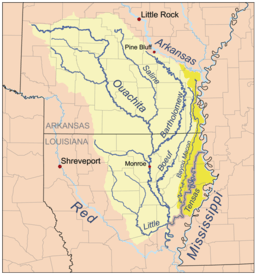 It begins in Desha County, Arkansas, and flows south, between the Boeuf River to its west and the Mississippi River to its east, before joining the Joe's Bayou south of Delhi in Richland Parish, Louisiana. Bayou Macon is about 218 miles (351 km) long. 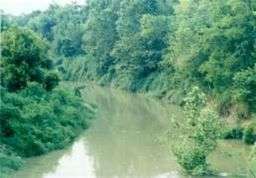 L. D. Knox of Winnsboro, a perennial Louisiana political candidate, owned some 1,400 acres (5.7 km2) about Bayou Macon, land which he hand cleared and cultivated in what he considered to have been an aberrant but advanced style of agriculture. This 1962 bridge over Bayou Macon (2013 photograph) between East and West Carroll Parish in northeastern Louisiana was replaced effective March 24, 2014 with a new structure valued at $4.6 million. Some seven hundred vehicles on Louisiana Highway 134 cross the bridge daily. Governor Bobby Jindal came to West Carroll Parish for the bridge dedication. ↑ "Obituary of L.D. Knox". ’’Monroe News Star’’, June 1, 2009. Archived from the original on March 1, 2012. Retrieved June 6, 2009. ↑ "Jindal celebrates bridge opening in West Carroll, March 24, 2014". Monroe News-Star. Retrieved March 25, 2014. "Bayou Macon". Geographic Names Information System. United States Geological Survey. Retrieved 2014-01-05.